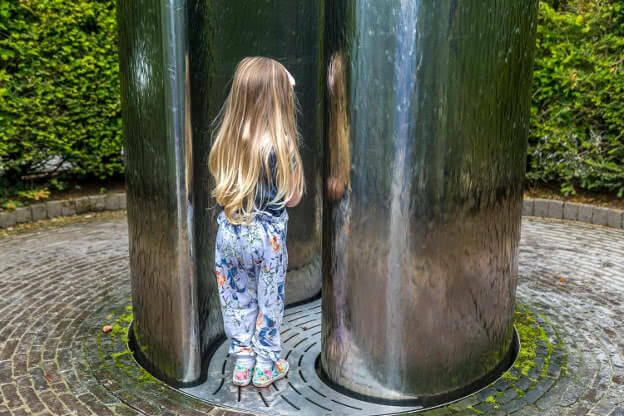 Hailed as the most spectacular gardens to be created in Europe in the last 100 years & platinum award winners in the National Loo of the year awards, Alnwick Gardens is one of Northumberland’s biggest tourism draws, designed to astonish & delight. a history of Alnwick gardens and what you can learn from visionary Duchess Jane Percy's sometimes turbulent life. What there is to experience and why it's special. 3 fine options of where to stay in Alnwick, from the superb to the inexpensive. The best of the other things to do in Alnwick town if it rains. How to have the best time at Alnwick's special Treehouse restaurant. Jane was born in Edinburgh a pleb. As a child she helped her mother maintain Kailzie Gardens Peebles, in the Borders. At 16 she met older man Lord Ralph Percy (17) at a party. They both went to the university of Oxford, they were head over heels in love and married upon graduation, despite their parents protests that they were too young. Ralph was a property surveyor and helped his elder brother the Duke, manage Alnwick castle and estates, until 1985 when his brother overdosed on Amphetamines and died of heart failure. Ralph succeeded to the Dukedom and, by accident, Jane became the first Duchess not to come from the titled aristocracy, a breath of fresh genes before the Percys go volatile and mentally infirm like the Gaunts. She was restless in her ceremonial role and in 2000 her husband suggested she renovate Alnwick Garden. Alnwick garden was a large ornamental garden outside the Castle walls, mostly turned over during world war II and put to work growing food. The Duchess set up a charitable trust to run the garden and started work. It is now one of Northumberland’s most visited attractions, hailed as the Versailles of the North, but it was not without blood. Jane is a practicing martial artist and introduced cage fighting to the gardens. 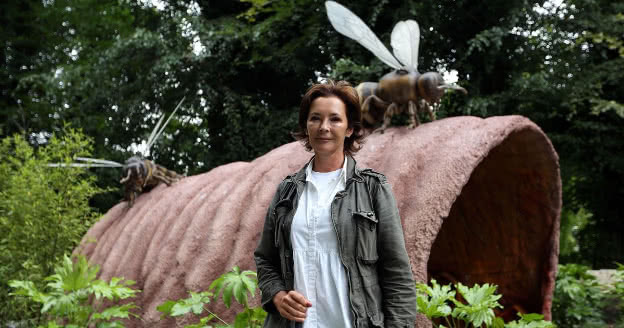 English heritage accused her of being hellbent on destroying one of England’s greatest gardens, Jane had to spend £500,000 on research and legal fees to defend her position as director of the gardens, as English heritage sought to preserve the abandoned 19th century gardens. In 2004 the Duchess collapsed from the pressure and was hospitalised. She considered resigning from the trusteeship. 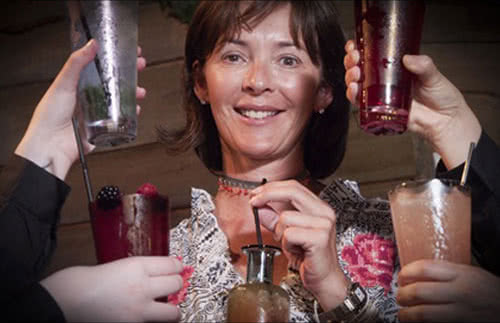 Instead Jane set out a plan to step down upon completion of her vision in 2015. However plants don’t grow to command. As the Duchess vision began to be realised and draw visitors The Daily Telegraph’s Mary Keen, a garden designer and critic, described it as "popular entertainment, the dream of a girl who looks like Posh (Victoria Beckham) and lives at Hogwarts". Jane responded I’m inspired by Eurodisney and Las Vegas. Mary choked on her crumpet. In 2001 foot and mouth disease decimated the area, many farmers were driven bankrupt. Northumberland was broke. Jane was spending 5 million constructing the water cascade, the centerpiece of the gardens and farmer’s wives began baking for the cafe. In that year 100 locals and farmers turned their houses and outbuildings into B&Bs to cope with the Gardens’ visitor demand. The Duchess was resuscitating locals’ lives. Are feted as the most innovative and radical public gardens in Britain since WWII. They employ 1400 people directly and have contributed £236.8 million to Northumberland's economy. 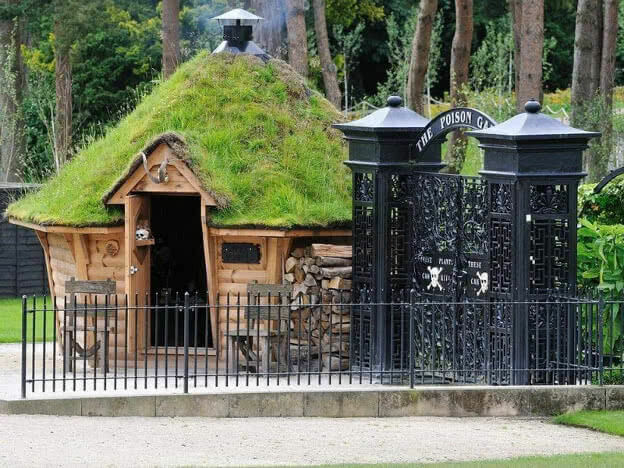 Much of the Gardens are intended to enchant children, with the Giant's Adventure and planned Elf village that's being built upon; recently they started an Elder-berries programme to stimulate lonely old folk. The Gardens draw tourism as well as being at the heart of Northumberland's community, a testament to the drive, vision and committment of the Duchess. When you enter the eye grabbing feature is the double bass grand cascade down the center of the hillside towards you. 176,000 gallons a minute are pumped through 25 pools and waterfalls, the largest water feature of it’s kind in Britain. On hot summer’s days children riding plastic diggers, scoop up the water from a trough at the bottom of the cascade into the digger’s bucket and redistribute it to the supine bodies of their parents sunbathing on the grass. The Duchess says her idea of heaven is sitting in the sun with a cup of coffee, listening to the shrieks of happy children. The Gardens are her solution to this. To the right is of the entrance paths wind through 500 bamboo plants lit by LED lights. Water flows over two polished stainless steel shapes and one foot in front of the toher I squeezed along a path betwixt them without getting wet. Well too wet. There’s a mushroom-shaped water feature where surface tension and viscosity overcome gravity. It is water as wonder. To the left of the grand cascade 350 Japanese Tai Haku Cherry blossom orchard line the hill, the largest collection in the world. The ornamental ‘great white cherry’ was loved in ancient Japan but was thought to be lost for good. Until one was found in a garden in Surrey in 1923. All the Tai Haku trees in the world now descend from that specimen. The gardens has swings betwixt them for the full Imperial experience. They only bloom for 6 days a year in Spring though, so settle your hopes. So why all this? Well Duchess Jane Percy loves her stories, so I suspect she was so enamoured by the ‘Jurassic Park’ Cherry tale that she instantly demanded 350 Taihaku trees. The old ornamental Rose gardens crests the hill, the remnant of formal gardens for the old people so beloved by English heritage. In 2005 the most celebrated part of the Garden’s was added. A quiet legacy for the deceased Henry ‘Amphetamine’ Percy. They have a rare Home Office licence to grow cannabis in its Poison Garden. And stewards often must wear gloves when caring for the plants. The tour takes 15 minutes and many visitor’s report it as the favourite part of their visit. Do not smell the flowers. Or touch, or taste. During 2014, 7 people fainted from inhaling toxic fumes while walking through the garden. “People think we’re being overdramatic when we talk about [not smelling the plants], but I’ve seen the health and safety reports,” the duchess says. It’s mission is drug education, it features 100 varieties of toxic plants including cannabis, coca, opium poppies, the plant that is the source of Ricin. If you’re a terrorist, or you want to know how to cultivate your own class A drugs the Garden is your uni. Can they make Wolfsbane? No Alnwick has vampires not werewolves. 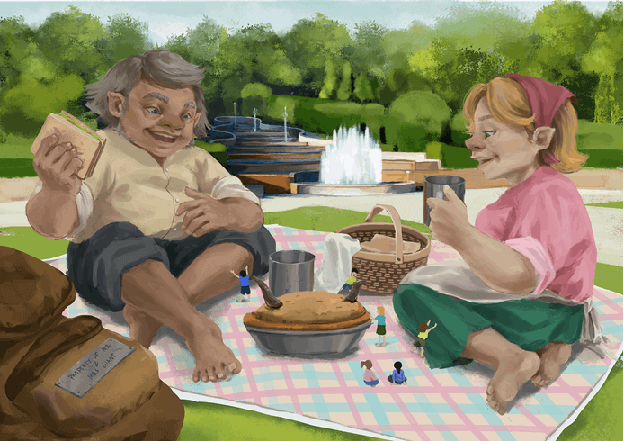 There is a real-life Giant and Giantess inhabited the gardens you can interact with via an app. He is a very lazy messy giant as his wife will tell you, and through the app you can join the adventure to discover where his left his belonging around the garden - they’re all over the place. How cool is this? Is a fairy tale experience to remember. At 560 m² it is one of the largest wooden treehouses in the world, nestled amongst the canopy of 17 Lime trees, linked by wooden walkways, twinkling lights and centered around a roaring log fire; the rickerty, ramshackle building echoes the Weasley’s Burrows. The Burrow and it’s accompanying pigsty were designed to look like Arthur Weasley had built them himself. All higgedly piggedly, beams not positioned right, no wall at a right angle, every worktop surface sloped, the leaning tower of Weasley. Arthur is perpetually hurried and disaster prone and the Burrow was held up by magic and love. The model of the Burrow was set on fire for the Half Blood Prince, it was totally destroyed. 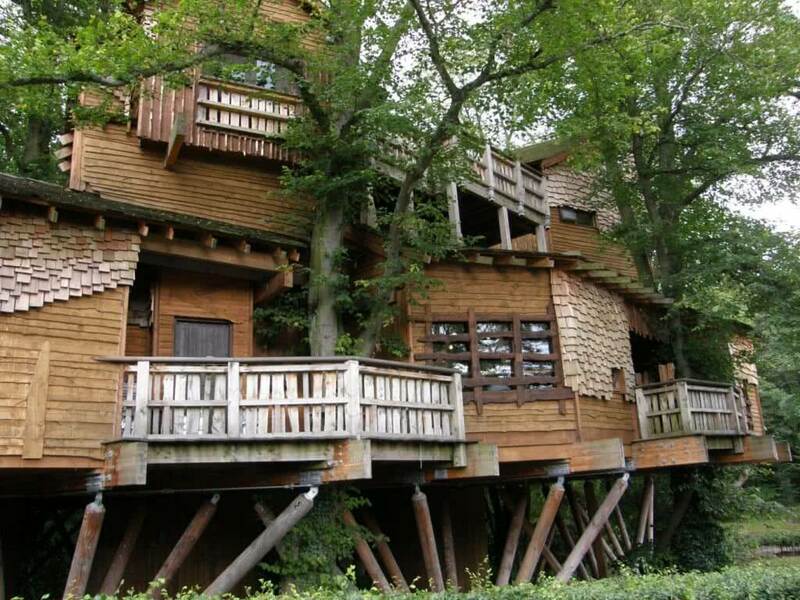 Alnwicks’ wonky, higgedly piggedly treehouse restaurant is the nearest thing the world now has. And it's glorious. You sit in heavy and rough hardwood chairs, branches twisting around you while eating British dishes, ingredients sourced from Northumberland. Choice is exhausting so to make it easier they list the Jane Percy’s favourite dishes, and even offer ‘Deadly Jane’ cocktails of her own devising - she is a Duchess after all. 'I'm not at all drunk'. Hic. Jane says enhancing peoples' lives is a serious business. The drinks are what will make your wallet rise up out of your pocket and drift up into the heavens. It's very popular, advanced booking is required. Parking usually cost £3 in the carpark but combine your visit to the treehouse and use Alnwick gardens carpark, it’s free! If you’re intensely boring like me, and don’t want your date remembering that then choose a night with more stimulation. One thing to check out on the way to the treehouse is well, the rope ladders, pretend it’s Raiders to the Lost Ark and crack your bullwhip. The giant bathing in the lake nearby is disgusting, watch long enough and he’ll fart! If it’s a rainy day, these might be better than the Gardens, you could stoll through the old town and shop hop. Also known as Bondgate Tower, it’s an impressive 15th century gateway in what was once medieval town walls. It divides Bondgate Within from Bondgate Without. The walls were built in to defend the town during a period of frequent raiding from the Scots who treated the Northumberland as an free Bank, this obviously damaged the Alnwick economy. Bailiffgate Museum is in a converted church a stones throw from the Castle’s barbican. It has a wooden fire engine that was carried, like a Royal sedan chair, to the scene of fires - no kidding! It’s a people’s museum telling the story of working folk rather than the Duke and Duchess and Hotspur’s whose history is told at the Castle. There are lots of hands on activities for younger children. Adults £4, children £1. It usually closes around 16.00, before the Castle, check the opening times and days. One of the largest second hand bookshops in Britain. Famous because it’s in a restored railway station, there’s a station buffet amongst the second hand books and it’s something special. Searching through old books the staff discovered the 'Keep calm & carry on' wartime poster & started the craze. 1.3 miles from the Castle, it’s a nice restaurant / bed and breakfast, but Potter wise well there’s no wall mounted Hog’s head drooling into a dish, the bartenders aren’t reported as gratingly grumpy, it’s sparkling clean, ug, what a disappointment. 321 meters from the Castle, it’s in the heart of town, a charming 2 storey 300 year old coaching inn, refurbished in 2007. Some rooms face onto the street so you would be woken by passing carriages much as 300 years ago. The Swan’s headliner is the Olympic Dining room, so called because all the beautiful windows, carved oak panels were rescued from the Titanic's sister ship, Olympic in the 1930s. If you’re not up for a full meal it serves tasty cakes and coffees, and trounces the Castle’s cafes when they are rushed of their feet with visitors. The dining room eclipses the guest rooms - it is an old coaching Inn after all. 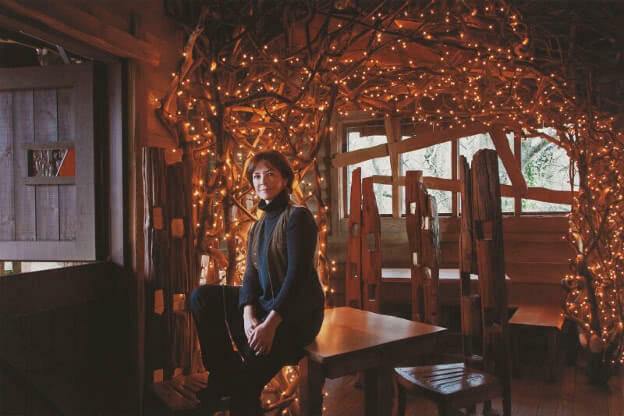 The Olympics’ celebrity is probably what inspired the Duchess to create Alnwick gardens’ fantasy restaurant the Treehouse. Loved because of its’ value. 640 meters from the Castle, housed in the town’s former Court house built in 1856. The hostels rooms are clean bright YHA identikit but you can hire private rooms and it has free car parking. Some rooms enjoy a loud ticking and chiming from the Church clock across the road, so you won’t be late for the Castle’s opening. Alnwick Castle on the hill opposite. Probably the most boring Castle in Britain. How to get to Alnwick, all your transport options. Alnwick Gardens website for their superior pictures.